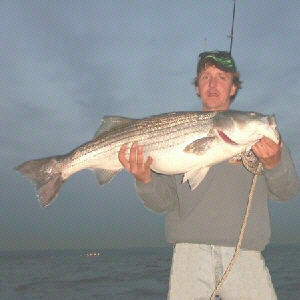 Richard Ferreira from Cortlandt Manor, NY was fishing on the Hudson River aboard his boat in early May, 2004. He was fishing the Croton Bay area and was using live herring for bait that he purchased from Buchanan Bait and Tackle. That was the winning combination that produced this fantastic Hudson River striped bass. Richard says the fishing has been super so far this season. He has even come close to placing in some of the local contest this year. The Hudson River is 315 miles long and starts in the Adirondack Mountains and flows into the New York City Harbor. The Hudson River is tidal river and the tides can rise and fall 5 feet with the oceans tides. The New York State Barge Canal connects the Hudson with the Lake Erie, Lake Ontario, Lake Champlain, and the St. Lawrence River. The Hudson River was once a severely polluted river and almost devoid of life, but has had an amazing recovery over the last 30 years. The Hudson River is home to over 200 species of fish including the various anadromous fish. The following species of fish American shad, river herring, and striped bass are anadromous and will migrate up the Hudson River every year to spawn. These fish can go as far as the Federal Dam located in Troy. After spawning they will return to the Atlantic Ocean. The first year of shads, herrings, and striped bass lives are spent in the river before returning to the ocean. The outlook for the Hudson River is now very bright and is another American success story.